Are you looking for a zero maintenance, strong, durable workshop? This fantastic metal Store More building could be just what you need. 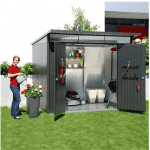 Built with amazingly tough galvanised steel, it benefits from a superb 3 coat painted finish. This paint not only gives the building a more attractive design, but it also really helps to protect each panel against the elements. One of its standout features is the ventilated gables. These ensure adequate airflow throughout the building and really help to prevent condensation. The 20 year guarantee against rust and perforation gives you ultimate peace of mind that this workshop is built to last. Its high tensile steel construction protects the building from rust, whilst also significantly increasing its durability. As well as two large front double doors, the building also comes with a useful side door, allowing quick and easy access when it’s needed. Another useful feature of this workshop is the fact it is wind-proof. Even high winds won’t cause the building to bend or shake. As it doesn’t come with a floor, it is ideal for heavyweight storage. So storing machinery and really heavy equipment won’t be an issue. The assembly is also easy, which is a definite advantage with a building of this size! All in all we highly recommend this to those who want a workshop they can build, use and never have to maintain. Initial high cost may be off-putting. However, its zero maintenance and range of excellent durability features more than make up for this in the long term. This is a generously spaced, large metal workshop. 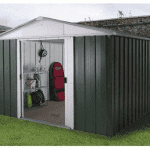 Due to its huge size it could also be used as a hobby shed, home office, general storage space or even a home gym. It has a lot of potential and its 2 door access allows you entry into different parts of the building, making it easy to use it for two different purposes. 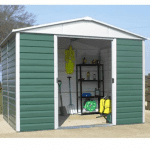 Despite being made from metal, the workshop comes with an attractive painted finish. This means it will look great no matter where you install it. The main measurements that stand out here are the height of the eaves and the size of the doors. The sheds apex roof does increase its height significantly, but even compared to other similar buildings, this one seems to be a lot taller. So if you’re looking at storing tall, large equipment and machinery, the building will give you plenty of space to work comfortably. The doors are also taller than average and more importantly, are wider than the average workshop too. The amount of space you are provided with to access and transfer items out of the building is fantastic. Even the bulkiest machinery and equipment won’t pose a problem when it comes to getting them in and out of the workshop. The width is pretty standard for this size building, but the depth is very impressive. This is a very long building so you will need to keep that in mind when trying to figure out where to assemble it. When you look at the workshop, it appears to have a very short apex roof. Compared to most outdoor buildings with this style roof, it is definitely less prominent. However, that in no way minimises its height. In fact, it actually gives you more internal height due to the fact that the ridges are taller. With the roof installed higher up than it is on most buildings, you’re left with an incredible amount of headroom. Even the tallest people will find this extremely spacious and comfortable to walk around in. The roof also still gives the building exceptional element protection. Thanks to its sturdy metal design, it doesn’t even require a roof covering to protect it. Water will naturally bounce off, rather than soak in, as it hits the workshop. It will also run down the front and rear of the roof, directly onto the ground below. It is constructed with high tensile steel, just like the rest of the building. This provides an outstanding strength, giving you peace of mind that the roof won’t cave in over time. No floor is provided with the workshop so this does mean you will need to build it on a solid, ideally concrete, surface. Obviously due to the depth of the building, this could be a problem. Of course you do have the option to add paving slabs, or concrete over the area yourself. However, this will add to the amount of work needed to be done throughout installation. The advantage of the floorless design is that you can store anything, no matter how heavy, without worrying about whether the floor will comfortably hold its weight. This is one of the main reasons the building functions great as a workshop. The entire structure of the building is created with 0.3mm galvanised steel. It has also been dipped in zinc to provide extreme rust resistance. In terms of metal buildings, this is definitely one of the toughest out there. Galvanised steel is exceptionally long lasting and is also virtually impossible to break into. So not only is the cladding long wearing, it’s also very secure. Even though the steel construction is incredibly durable within itself, the manufacturer has gone a step further and added not one, not two, but three fantastic coats of paint. This specialised paint further helps to boost the shed’s resistance to the elements, providing amazing longevity. A portal frame has been used to ensure the structure is 100% supported and it has also been double braced throughout. There are a lot of features of this building that we really like, but by far one of the most beneficial for us is the fact it requires absolutely no maintenance. 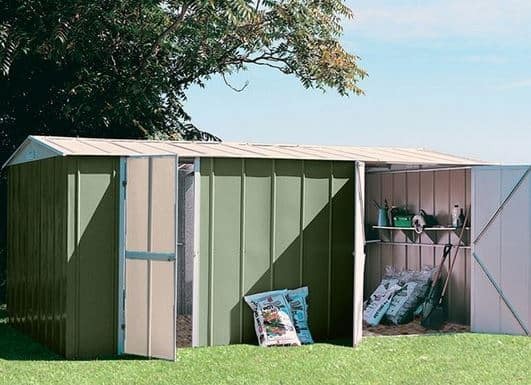 This means you never have to treat the shed. 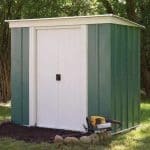 That’s the only potential downside to wooden sheds as they do typically require a yearly high quality preservative to be applied. So if maintenance really isn’t your thing, you’ll love this Store More Canberra metal workshop. The fact it doesn’t require any treatments makes the 20 year manufacturer’s warranty against rust and perforation even more impressive. You truly do receive exceptional peace of mind when you buy this building. With two entry points into the workshop, you are given ultimate accessibility. It also allows you to use different parts of the building for different purposes. At one end, you have large double doors which allow you to transfer even the tallest and bulkiest of machinery. They also provide more than enough space to drive a motorbike in and out of the building. So in terms of what you can store in this side of the workshop, it does offer you incredible versatility. Then at the other end there’s a single door which provides slightly quicker and easier entry into the workshop. The building comes with a windowless design to ensure 100% privacy. Now with metal buildings, the lack of windows could lead to a problem with condensation. 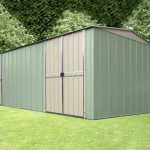 However, this one comes with ventilated gables so the workshop gets a good amount of airflow; eliminating the risk of condensation. This means your storage will be safe, as well as dry, all year round. You will really struggle to find a more secure and private workshop than this one. With its thick galvanised steel cladding and windowless design, it ensures whatever you do keep in the building remains safe from prying eyes. The doors are also pad lockable so you can further improve its security if you need to. Obviously if you are using it as a workshop, you’re likely going to be storing expensive machinery, tools and equipment. Therefore it makes sense to invest in as much security as possible. 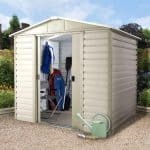 There’s just one extra you can buy with this workshop and that’s the Storemore Metal Shed Anchor Kit. We actually advise you do invest in this as it helps to literally ‘anchor’ the building, making sure it stays put even in the heaviest winds. It’s really affordable at just £14.99 and the manufacturers have also made it incredibly easy to install. It comes with a masonry drill bit and cross slot headed screws. These can be screwed into the pre-drilled holes located on the base of the building. What’s great about this kit is the screws can be removed if you need to disassemble the building or move it for whatever reason in the future. Be aware that this anchor kit is only designed for use on concrete bases. Giving this a 10/10 rating for quality was a no-brainer for us. Made from extraordinarily tough galvanised steel, every part of the workshop has been created to an exemplary high standard. With a 20 year manufacturer’s warranty, what we find most impressive about the durability of this workshop is the fact it requires absolutely no maintenance. It is naturally long lasting thanks to the tough materials used to create it. The interior storage space of this building is huge. No matter how bulky or tall your equipment, tools and machinery are, there will be more than sufficient space inside. Very simple to install, the only factor to take into account here is that it will take a long time to erect. You need to consider its size and leave at least a day to put it together. What you may find surprising is just how lightweight the panels are. Despite being made from very tough materials, the building has a surprisingly lightweight design, making it less strenuous to put together. It is still recommended you only attempt installation with 2 people however. Considering its longevity and exceptional quality, this workshop provides an outstanding level of value for money. Final Thoughts: There are so many things to love about this metal workshop. The fact it requires absolutely no maintenance is perhaps one of its most attractive features. It is also designed to offer ultimate protection against the elements. Not only is it exceptionally waterproof, but it also offers excellent resistance against high winds. Ventilated gables help to prevent condensation, while the floorless design ensures you can store really heavy equipment with ease. Its 3 coat painted finish leaves a stylish building that will really withstand high levels of daily wear and tear. Overall we do recommend this for anyone looking for a stable, strong and private workshop.